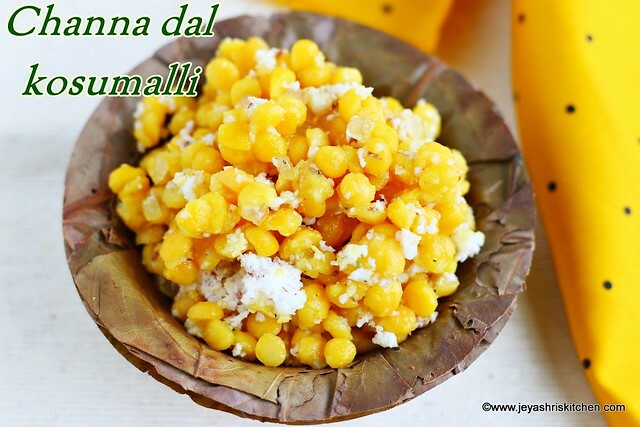 Channa dal sweet kosumalli is a traditional recipe served in Tamil brahmin weddings as a part of the feast. the crunchiness of the kalkand(rock candy) and the cardamom flavor enhances the taste. Though i have made this kosumalli few times at home, but never clicked once. Few days back i made this and clicked it too. It is a very simple recipe, if you have cooked channa dal in hand then it is quite easy to put everything together. You can make this as a neivedhyam for navaratri too. 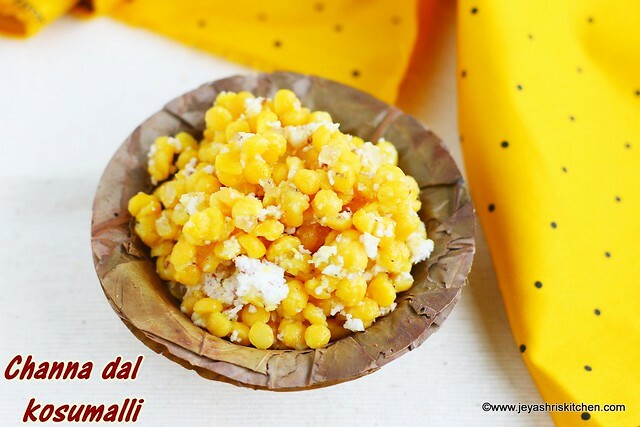 Check out my other Navarati sweet and sundal recipes. Soak the channa dal in water for 15 minutes. Add the salt and turmeric powder to this. Add the sugar, cardamom powder, kalkandu and coconut. Serve the sweet sundal as a part of the South Indian menu or as a Sundal too. Do not cook the channa dal mushy. Soaking the dal ensures perfect cooking. If it is under cooked, it may harm the tummy.